The Bridgetown Primary School curriculum is designed to encourage a love of learning and to enable every child to develop skills and understanding within real contexts through hands on experiences. The national curriculum 2014 programmes of study are therefore taught within the context of topics that provide meaningful cross-curricular links and allow children to develop deep knowledge and apply key skills in a broad range of activities throughout their time at Bridgetown. Learning is extended and supported through a wide range of experiences beyond the school provided by visiting professionals, external visits and our partnership with organisations such as the African Children's Choir and The Royal Shakespeare Company. If you would like to learn more about the Bridgetown curriculum or to see it in action, please come along to one of our open days. Details will be published in newsletters and on the home page of our website. To see more in relation to specific year groups, visit the year group pages in the 'our learning' section of our website. Phonics refers to a method for teaching speakers of English to read and write their language. It involves connecting the sounds of spoken English with letters or groups of letters (e.g that the sound /k/ can be represented by c, k, ck or ch spellings) and teaching them to blend the sounds of letters together to produce approximate pronunciations of unknown words. In this way, phonics enables people to use individual sounds to construct words. For example, when taught the sounds for the letters t, p, a and s, one can build up the words "tap", "pat", "pats", "taps" and "sat"
You may find this Literacy Trust phonics glossary useful. At Bridgetown, regular phonics teaching and practice follows the Letters and Sounds programme. 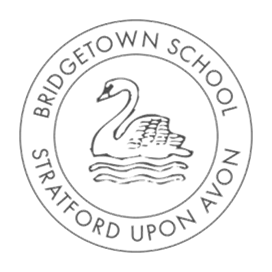 Opportunities for reading at Bridgetown School are rich and varied from free choice from our extensive school library to regular shared, guided and individual reading with in the classroom. In the Foundation Stage and Key Stage One the children are encouraged to apply many reading strategies and reinforce their phonics skills through our book banded reading schemes. A combination of Oxford Reading Tree and Collins Big Cats act as our main independent reading schemes. Through this, children encounter treasured stories, non fiction and phonic texts. To ensure breadth, variety and a range of different text styles, other schemes are 'bookbanded' into coloured bands for children to access in relation to their reading ability. In addition to this, children have regular guided reading sessions using the Rigby Star Guided series. Teachers and teaching assistants carry out continuous assessments linking the texts to curriculum 2014 targets. The Bridgetown mathematics curriculum follows the requirements of the national curriculum 2014 and is designed to develop creative mathematical thinking and problem solving, as well as key mathematical knowledge and calculation methods. Please see the documents below for key learning in each year group.